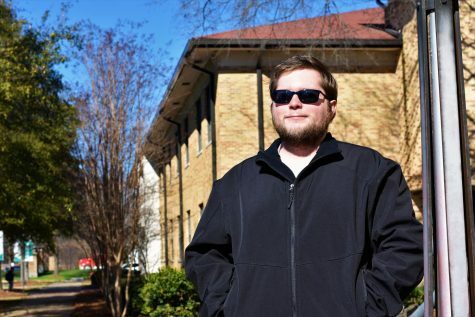 Luke Terrill is an English major with a philosophy minor. Luke originally started school at Mississippi State University as a chemistry major, intending to go to medical school. After deciding that wasn’t for him, he changed his major to architecture and transferred to Holmes Community College; however, he found that he was not happy in architecture, and he changed his major again—this time to English. After obtaining his associate’s degree, he transferred to Delta State. He enjoys Literature by Women, taught by Doctor Judith Coleman, and he also enjoys knitting in his spare time. He is originally from Texas, and it is his ultimate goal to move back there. He wants to be closer to his family.